Spring has finally arrived here at the Crossroads! We’ve had a few absolutely glorious days recently, and I hope you’ve been able to enjoy some beautiful sunshine, too. When we have nice weather, we like to eat on our front porch. 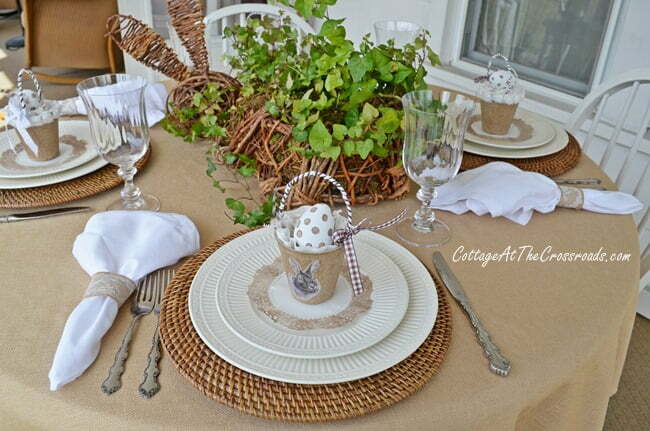 So I have a tablescape to share with your today, all done with bunnies and neutral colors. Normally when you think of spring and bunnies, you think about pastel colors. But pastels just don’t work with the colors we use on our porch. So I used all neutrals on my table today, and I think it looks all fresh and springy. That’s because there are bunnies involved! Lots of them! 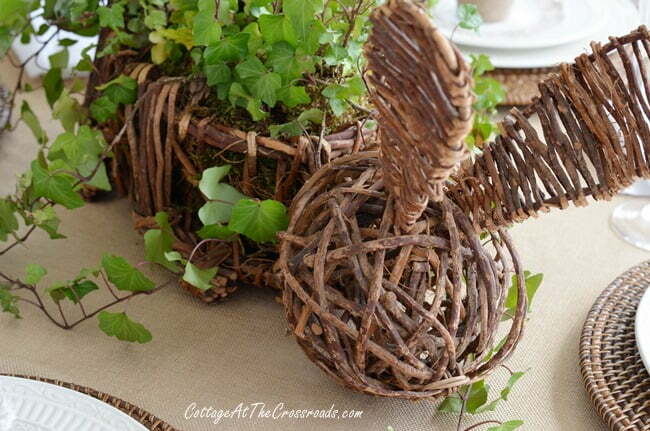 My centerpiece is this wicker bunny that I picked up at the auction that I attend. It’s old and about to fall apart, but I planted it with some ivy that I’ve managed to keep alive this winter. So he’s all good to go for another spring! Leo teases me that I cannot keep ivy alive in the house. I guess it’s because it dries out so quickly I forget to water it! LOL! But I love how pretty the green color is against the neutral tablecloth. Since this is a casual setting, I’ve used my everyday Italian Countryside by Mikasa dishes that I’ve had for 17 years. But the chargers are new and are from World Market. The flatware is by Oneida. 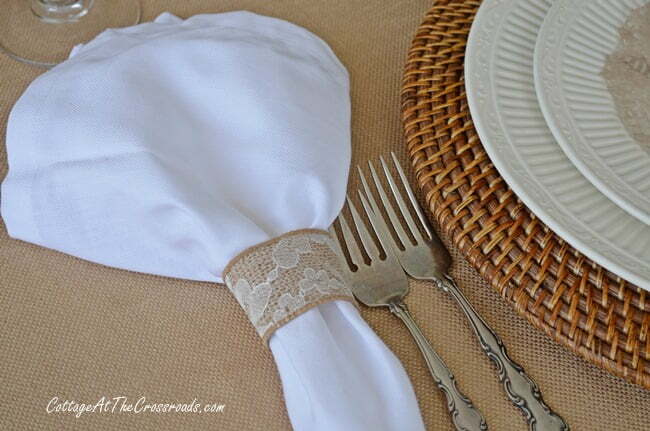 To make napkin rings, I used some lace covered burlap ribbon that you’ll be seeing in more porch decorations soon. The glasses are by Mikasa also. The lacy looking doilies are actually paper doilies that I painted with some watered down acrylic paint. Another quick and easy (and inespensive) way to bring another neutral to the scheme. 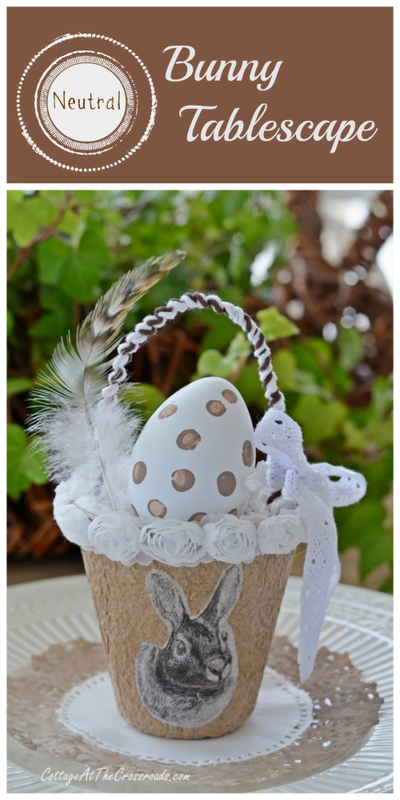 I love these little peat pot baskets that I’ve decorated with bunnies! I shared the tutorial HERE if you’d like to see how I made them. And since Easter will be here soon, I decorated these very realistic looking white eggs that I found at WalMart by dabbing a pencil eraser in some acrylic craft paint. Yep, it’s bunnies and more bunnies here at the Crossroads. What can I say? They are so darn cute, except when they get in our garden and nibble on our lettuce! 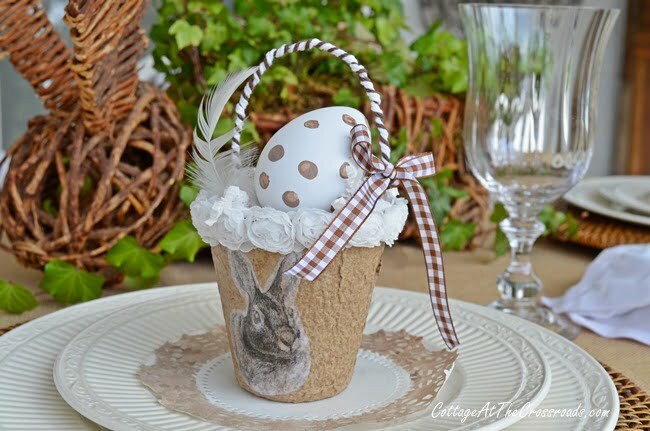 Oh I just love these adorable little bunny baskets. Did you get the eggs this year and were they white? Such a pretty tablescape. Love the centerpiece! We would be wearing our coats if we dined outside, maybe in a month! Wonderful table…the neutral colors are perfect. Great piece of wicker! Your table is very pretty! I am impressed with the little pots. They are so cute and hand painted too! You are very talented. 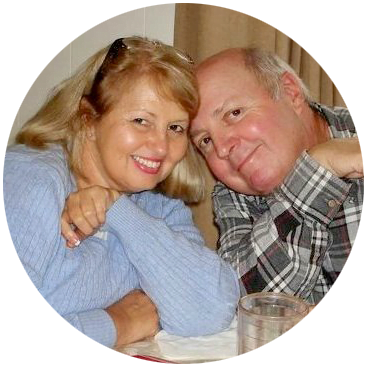 I am not sure how to join your blog……. Your table is beautiful! I love the mixture of white and natural elements. The pop of green is perfect and springy and cheery – and alive 🙂 (for now anyway)! I thoroughly enjoyed viewing your table. Thanks for sharing it with us. Love the tablescape! The neutrals are subtle but yell welcome spring. This is such a gorgeous table, love all the details and I really like the neutrals. Those peat pots are so adorable. This is my kind of Easter table. I love your tablescape! Cute idea for the peat pots. I have to get some, as I have some ideas brewing for using them. Hope you have a fabulous week! I love your neutral tablescape Jane! Your peat pots with the drawing of your bunny are adorable at the table! I love bunnies except when they are in the garden! Your tablescape is delightful! 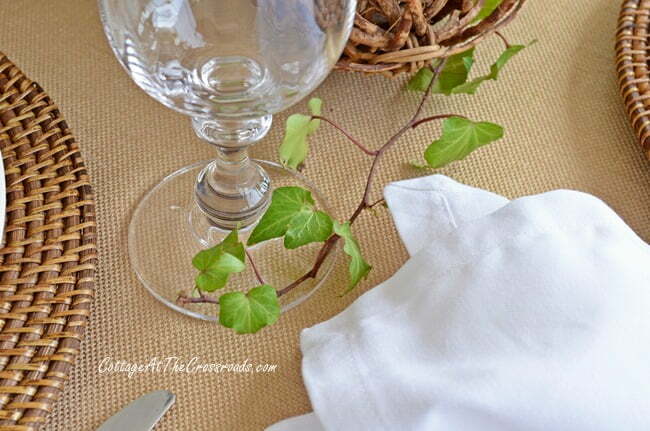 The green ivy gives the perfect pop of color to this beautiful neutral tablescape. I love the little peat pot bunny baskets. I am working on some peat pot baskets too but in white. I think I like the natural peat a better. Your new chargers look wonderful with the Italian Countryside china. 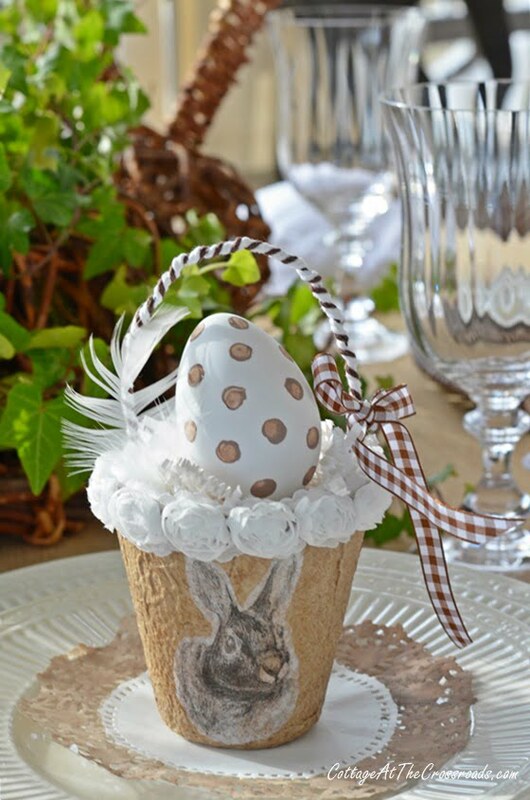 So cute Jane, love the neutrals and the polka dot eggs! I like it two, the green and neutrals go so well together! So sweet! 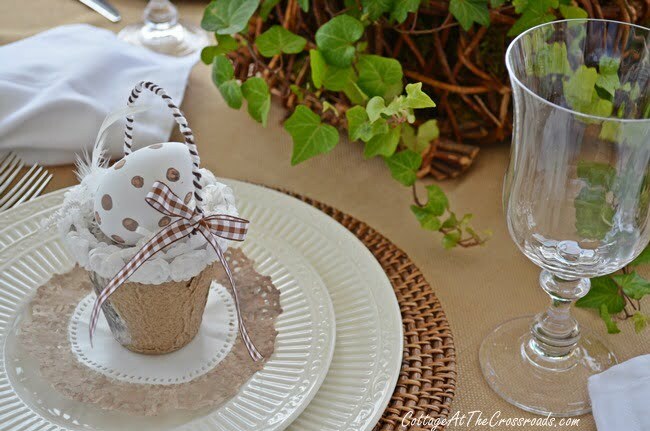 Love all of the details: the lace in the napkin rings particularly. I’d love to have you link to Seasonal Sundays! Jane, I think this is my favorite post you have ever done. Great job with the neutral decor. I really enjoyed this over pastels. 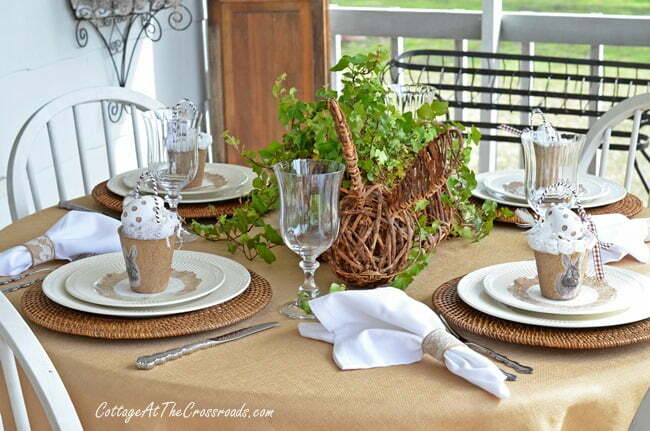 Jane, this is such a sweet table setting. I love the wicker bunny and I hope he lasts a bit longer. I have killed ivy, too so don’t feel bad. Thankfully what I have now is thriving. Yes, it does dry out fast. 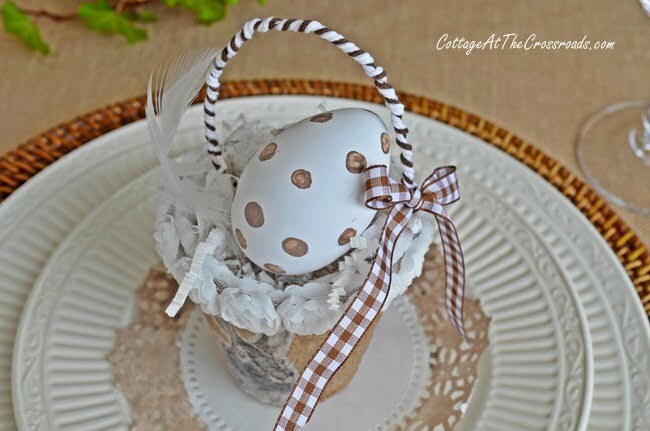 🙂 Your peat buckets and polka dot eggs are so cute and I love the neutral color in place of pastels. We have had beautiful weather too until today. Rain is coming back and the cold, too. UGH! Hi Jane and what a lovely tablescape. I love the neutral look of it. So peace ful.